Since the beginning of the uprisings in Tunisia, Egypt, Yemen, Libya and Syria in winter and spring 2010-2011, the national Arab televisions (state or private owned) have found themselves in a challenging situation. They have been forced to find a balance between traditional loyalties to the ruling power and loyalty towards journalistic standards of critical and objective coverage of popular national uprisings. Gradually, during the periods of uprisings, television has changed its coverage in accordance with the local national development of the revolutionary movements. This paper will analyse such changes of coverage. The basis of the analysis is the coverage of the uprisings in Egyptian television, primarily in news programs, in the period January – August 2011. The general argument of the paper is that Egyptian television in this period has gone through six phases in their coverage. In the paper the phases will be explored and illustrated by examples. Ehab Galal er adjunkt i Moderne Islam og Mellemøstlige Studier ved Institut for Tværkulturelle og Regionale Studier, Københavns Universitet. Han er ph.d. fra Københavns Universitet på baggrund af en afhandling om ’Identitet og livsstil på islamisk satellit-tv’. I hans nuværende projekt, undersøger han: “Audience responses to Islamic programming on Arab Television” med feltarbejde blandt arabisktalende seere i fire forskellige lande. Galal har publiceret flere artikler om arabiske medier på både engelsk og dansk; fx ”Modern’ Salafi broadcasting: Iqra’ Channel”, i K. Hroub (ed. 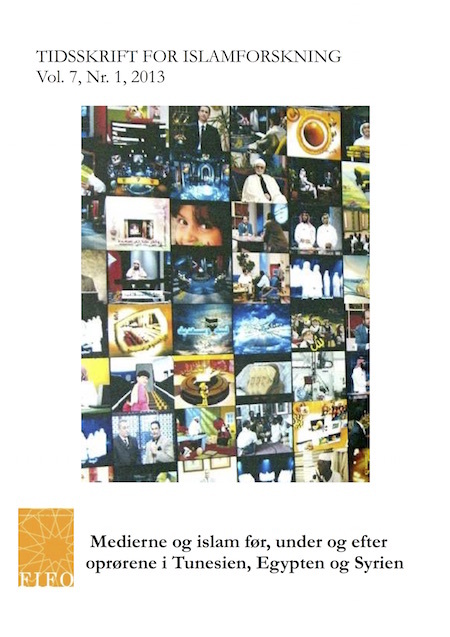 ), Religious Broadcasting in the Middle East (London: C Hurst & Co Publishers Ltd., 2012); “Transnational Islamic TV: a space for religious and gendered living”, i Jakob Egholm Feldt & Kirstine Sinclair (eds. ): ‘Lived Space. Reconsidering Transnationalism among Muslim Minorities’ (Peter Lang, 2011); “Islamisk satellit-tv og staten” (Islamic satellite-TV and the State) (Babylon, 2011); “The Muslim woman as a beauty queen” (Journal of Arab & Muslim Media Research, 2010); “Yusuf al-Qaradawi and the New Islamic TV “, i J. Skovgaard-Petersen & B. Gräf (eds. ): ‘Global Mufti. The Phenomenon of Yusuf al-Qaradawi’ (C Hurst, 2009). Ligeledes har Galal (sammen med Mette Thunø) redigeret bogen “Globale medier i verdens brændpunkter. Religion, politik og kultur” (Museum Tusculanum, 2009).